King of Judea; born about 100 B.C. ; died 49 B.C. He was the youngest son of Alexander Jannæus, whose political and religious predilections he inherited, while his elder brother, Hyrcanus II., seems to have leaned to the side of his mother. Although he had no rightful claim to the throne, he entertained designs upon it, even during the life of his mother. He courted the nobles and military party by constituting himself the patron of the Sadducees and bringing their cause before the queen. The many fortresses which the queen placed at the disposal of the Sadducees, ostensibly for their defense against the Pharisees, constituted in reality one of the preparatory moves of Aristobulus for the usurpation of the government. The queen sought to direct his military zeal outside Judea, and sent him (70-69) against Ptolemy Mennæi; but when the undertaking failed, Aristobulus resumed his political intrigues. He left Jerusalem secretly and betook himself to his friends, who controlled the largest number of fortified places, with the intention of making war against his aged mother. But the queen died at the critical moment, and he immediately turned his weapons against his brother Hyrcanus, the legitimate heir to the throne. The war resulted in victory for Aristobulus. After a reign of three months, Hyrcanus abandoned the royal title in favor of his brother, in return for which Aristobulus allowed him the unlimited use of his sources of revenue. This easily acquired peace did not long endure. Hyrcanus was prevailed upon by Antipater to induce Aretas, king of Arabia, to make war against Aristobulus. In consequence of the victory of Aretas, added to the abandonment of Aristobulus by the Pharisees—the most powerful party in Jerusalem—who had gone over to Hyrcanus, Aristobulus was compelled to withdraw to the Temple Mount. The distressing siege which followed, about which most wonderful stories are told (see Ḥoni ha-Me'aggel and Hyrcanus II. ), led to no decisive result. A third party—Rome—was therefore called in to unravel the complicated situation, and the effects of this intercession proved not only injurious to the brothers, but in the end brought about the destruction of the Jewish state. At that time (65) Pompey had already brought under subjugation nearly the whole of Asia, and had sent his legate, Scaurus, to Syria, to take possession of the heritage of the Seleucids. Ambassadors from both the Judean parties waited upon Scaurus, requesting his assistance. A gift of four hundred talents (three hundred, according to some) from Aristobulus turned the scale in his favor. 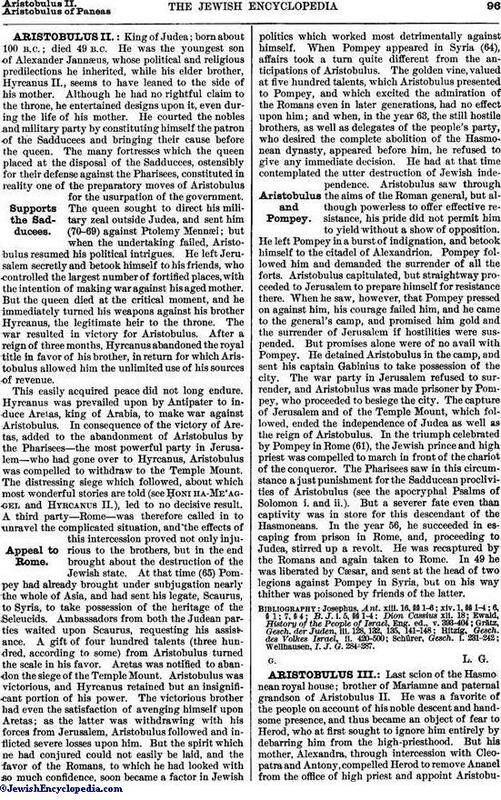 Aretas was notified to abandon the siege of the Temple Mount. Aristobulus was victorious, and Hyrcanus retained but an insignificant portion of his power. The victorious brother had even the satisfaction of avenging himself upon Aretas; as the latter was withdrawing with his forces from Jerusalem, Aristobulus followed and inflicted severe losses upon him. But the spirit which he had conjured could not easily be laid, and the favor of the Romans, to which he had looked with so much confidence, soon became a factor in Jewish politics which worked most detrimentally against himself. When Pompey appeared in Syria (64), affairs took a turn quite different from the anticipations of Aristobulus. The golden vine, valued at five hundred talents, which Aristobulus presented to Pompey, and which excited the admiration of the Romans even in later generations, had no effect upon him; and when, in the year 63, the still hostile brothers, as well as delegates of the people's party, who desired the complete abolition of the Hasmonean dynasty, appeared before him, he refused to give any immediate decision. He had at that time contemplated the utter destruction of Jewish independence. Aristobulus saw through the aims of the Roman general, but although powerless to offer effective resistance, his pride did not permit him to yield without a show of opposition. He left Pompey in a burst of indignation, and betook himself to the citadel of Alexandrion. Pompey followed him and demanded the surrender of all the forts. Aristobulus capitulated, but straightway proceeded to Jerusalem to prepare himself for resistance there. When he saw, however, that Pompey pressed on against him, his courage failed him, and he came to the general's camp, and promised him gold and the surrender of Jerusalem if hostilities were suspended. But promises alone were of no avail with Pompey. He detained Aristobulus in the camp, and sent his captain Gabinius to take possession of the city. The war party in Jerusalem refused to surrender, and Aristobulus was made prisoner by Pompey, who proceeded to besiege the city. The capture of Jerusalem and of the Temple Mount, which followed, ended the independence of Judea as well as the reign of Aristobulus. In the triumph celebrated by Pompey in Rome (61), the Jewish prince and high priest was compelled to march in front of the chariot of the conqueror. The Pharisees saw in this circumstance a just punishment for the Sadducean proclivities of Aristobulus (see the apocryphal Psalms of Solomon i. and ii.). But a severer fate even than captivity was in store for this descendant of the Hasmoneans. In the year 56, he succeeded in escaping from prison in Rome, and, proceeding to Judea, stirred up a revolt. He was recaptured by the Romans and again taken to Rome. In 49 he was liberated by Cæsar, and sent at the head of two legions against Pompey in Syria, but on his way thither was poisoned by friends of the latter. Wellhausen, I. J. G. 284-287.